In 2012, two directors made their debut with two wildly different found-footage movies – one of them was Josh Trank, who won critical praise with Chronicle, and the other was Nima Nourizadeh, who gained the exact opposite with the morally-repugnant Project X.
Flash-forward to three years later, and both directors have made their respective sophomore movies with much more traditional storytelling methods, once again with wildly different results. Trank, quite famously now, has received nothing but disdain for his failed reboot of Fantastic Four; and though Nourizadeh hasn’t exactly wowed the critics with American Ultra, it’s certainly a step-up from his first film, and that if anything qualifies it as a mild success. Nourizadeh directs from a script by Max Landis (who, funnily enough, also wrote Chronicle), which sees neurotic stoner Miker (Jesse Eisenberg) living a quiet life with his loving girlfriend Phoebe (Kristen Stewart) – until he’s revealed to be a lethal sleeper agent trained by the government, who is now targeting Mike for extermination. He and Phoebe must now fight a wave of operatives sent to kill him, while keeping their relationship alive as they face several obstacles, not all of them in the form of deadly assassins. After depicting such horrid and loathsome excuses for characters in his debut film, Nourizadeh seems to have gotten the memo and applied it to his two leads here, who are given much better material to work off of and are thus more identifiable as actual characters than anybody in Project X (honestly, we could go on about it all day, we hate it that much). It also comes down to the casting; Eisenberg and Stewart, who previously played a romantic pairing in Adventureland (and will play another in Woody Allen’s untitled next film, due out next year), share wonderful chemistry with each other, and every time they’re on screen together you sense a genuine connection between them, whether they’re opening up about their inner feelings or fighting off psychotic killers such as Walton Goggin’s “Laughter” operative. Their chemistry so strong that you actually want them to come out of it okay and still together, and Landis’ script even offers some interesting ideas about their past that help to keep the momentum going. Eisenberg and Stewart are easily the best elements of the movie, and if it had solely been about them then it would have made for a wholly satisfying flick – but then you have everything else from the government sub-plot to the stratospheric degrees of ultra-violence, which alter perspectives slightly and present an unbalanced flick. It’s not that they’re necessarily bad, they just don’t seem to fit around the much better parts of the movie – any time Eisenberg and Stewart have a moment together, it always seems to cut back to Topher Grace’s evil-in-every-sense-of-the-word government operative and his own feud with Connie Britton’s older and more experienced CIA agent, and it takes away some of the focus from what we actually care about. With regards to the violence, from people getting shot to necks being broken to teeth even being knocked out of mouths, it’s quite extreme and plain nasty at times. It’s certainly off-putting, especially for anyone who does not appreciate these levels of ultra-violence, and its implausibility is accounted for multiple times during the movie – when a character describes how someone’s lungs exploded when an object is jabbed into their throat, it’s questioned with cautious scepticism – but it’s surprisingly not that hard to get through when you know that there’s such a strong element being caught in the middle of it all. The one other thing we’ll note is the radically different tone to what the film is initially offering – the trailer makes it out to look like some kind of high-octane action comedy, but while the final product does deliver some of that the majority of it plays more toward a sombre and even dramatic tone, especially when Eisenberg and Stewart are spending screen-time together. It is jarring, and the film could have possibly used a bit more of a light-hearted tone, but it doesn’t destroy the film by any means. 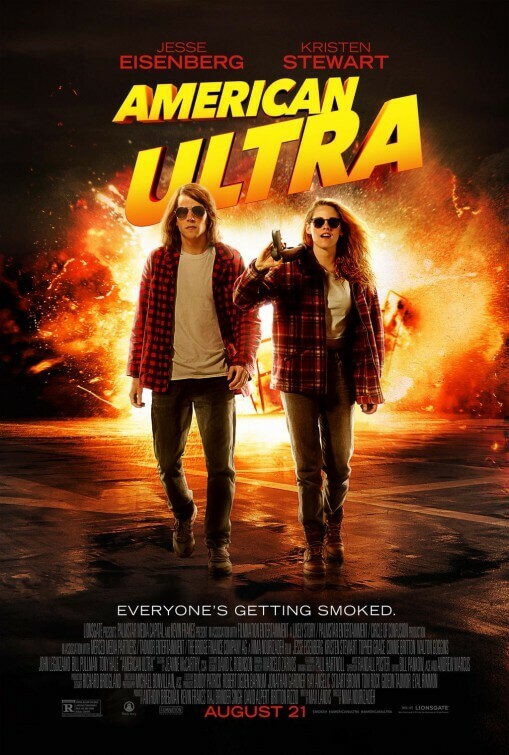 American Ultra is far from perfect, with overlapping sub-plots and extreme violence getting in the way, but the main relationship between Jesse Eisenberg and Kristen Stewart is so strong that it’s worth watching just for them sharing great romantic chemistry with each other.